Bath time is one of the joys of parenting -- and also one of the most headache-inducing. Slippery suds plus playful kiddos often equates to inhuman parental acts of juggling, balancing and cunning anticipation that can make the process of getting clean feel like anything but. Luckily, a solution to these woes has been developed. Enter Matimals, a unique and much-needed bathing product that is helping parents outsmart and conquer the dastardly drawbacks of bath time. Established in 2015, Matimals is the brainchild of mother-daughter duo Karin Davis and Kate Vu Quoc. Davis' husband, John Hill, was a physician assistant at Madigan in 1983 before being assigned to the 9th Division. After seeing her daughter struggle to dry off her son after bathing, Davis was reminded of how much of an ordeal the process could be. "I would have to tuck the towel under my chin, controlling the towel with only one hand," she said. "I was always nervous, and I knew that picking up a slippery, squirming baby with only one hand was potentially dangerous. Seeing my own daughter struggle to dry off her own son with minimal fussing felt like deja vu. I was instantly reminded how difficult the final stage of bath time -- drying -- can be." After nearly slipping on a wet floor with her grandchild in her arms, Davis had had enough. "That's when we thought about making a product where the transition from bathing to drying was less stressful and a more safe experience for both parents and infants," she said. "We wanted a product that wouldn't make bath time such a hassle, and one that would keep everyone involved warm and dry." According to the Matimals website, there are more than 43,000 wet-to-dry-related bathing accidents a year, and Matimals reduces the possibility of danger with its engineered design. Suction cups allow the device to stick to the tub, and plastic hooks provide a place to hang towels before they're needed. 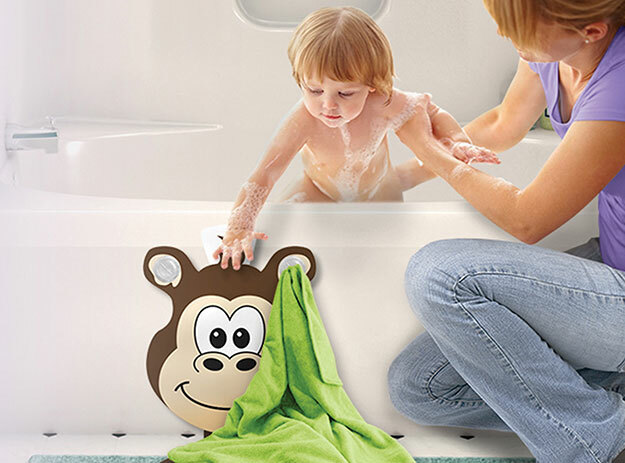 "You'll never again have to hold your squirming, wet toddler in one hand while trying to prepare a towel. If you've ever tried to, you know that this can be an accident waiting to happen," Davis explained. The "landing pads" help as well, adding an element of comfort for parents or grandparents to kneel on while they bathe and keep a watchful eye on children in the tub. When bath time is over, simply lift the child into the waiting towel attached to the Matimal, which provides a padded, chair-like space to dry them off. When finished, simply hang the Matimal up to dry until ready to use it again. Matimals are available on the website (matimals.com) in four animal options, each equally adorable: giraffe, monkey, zebra and tiger. What's better than hassle-free bath time? How about supporting a company that believes in giving back? "Our main focus for the Matimals this year will be to donate a portion of our sales to the Make-A-Wish Foundation," Davis said. "It's a charitable cause where we feel we can best help children in need." For more information about Matimals, visit matimals.com.